How clean are your screens? After years of use, your cinema screens can become dirty and dull –resulting in a less-than-optimal experience for your paying customers. After cinema screen cleaning, our customers have typically measured between 10-30% increase in luminance and gain from matte and pearl cinema screens when using the industry standard Digital Screen Checker from Harkness Screens. 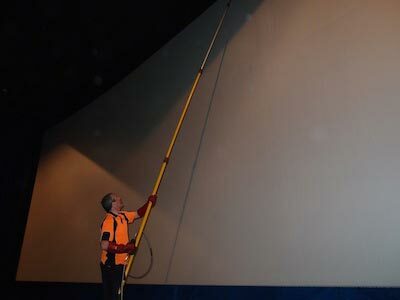 Please note that cinema screen cleaning can only be performed on matte white and pearl cinema screens as the surface coatings on silver screens are just too delicate for the process. If you want a sense of how it looks when dirty screens are getting cinema screen cleaning, please check out the above video on our YouTube site.